I’m in Matanzas Province, Cuba, traveling with Smithsonian Journeys. We were scheduled for a “block party with locals”. Which sounds boring. Except that it turned out to be with the local Committee for the Defence of the Revolution. 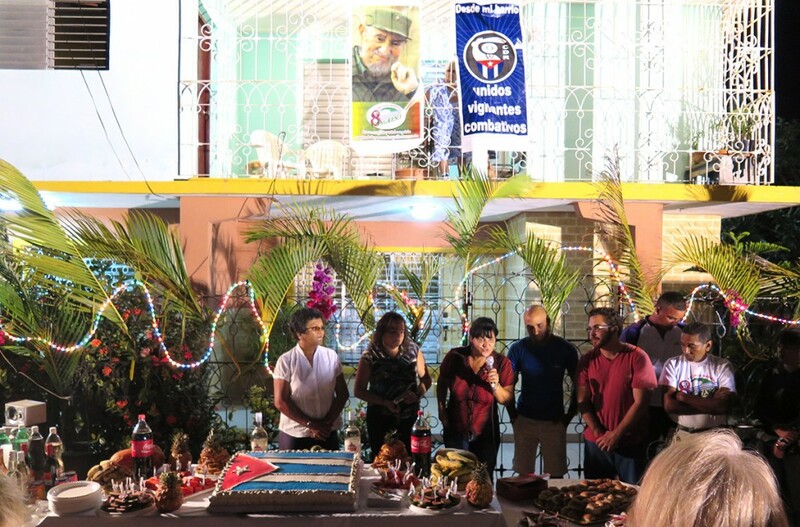 And the event had escalated – we had more than 200 locals attend and a local Communist Party official joined the event to make sure that we all got the Right Messages ™. 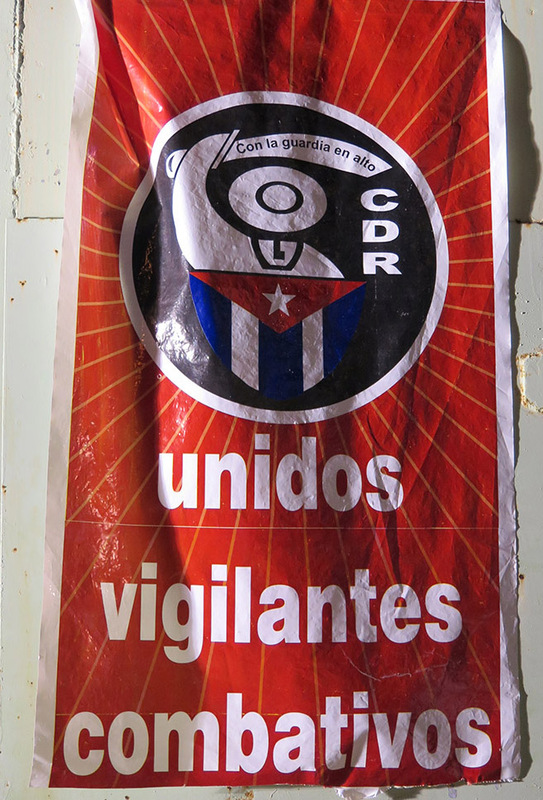 The CDRs were founded by Fidel Castro in 1960 as grassroots block level organizations to promote socialist values and to “Defend the Revolution” against both external and internal enemies. They used to have a significant internal monitoring role, although that has now faded and they are more focused on coordinating grassroots social services. The official organizer of our event was the local CDR President, a bulky, tough looking guy. But the introductory speech was from a tough minded woman who we were told was the Provincial Head of Ideology. Oh wow. She seemed to be treating the event as a career moment and gave a model speech, mostly targeted at the locals, extolling the virtues of the CDRs. She explained how the CDRs help organize blood drives, medical care, recycling, etc, etc. There was various revolutionary rhetoric throw in, emphasizing the active role of the CDRs in defending the Revolution today. At the end she concluded with how they “watch over the community 24 hours a day”. I am sure she meant this in a benevolent sense, but she also seemed oblivious to the more sinister connotations. Our Cuban-American guide Alex dutifully translated the speech, but he was looking increasingly distanced as the rhetoric mounted. His expression was a strange mix of disapproval and wry amusement at his predicament, eventually shading to fairly overt hostility. But he bravely stuck it to the end. The CDR president organized dancing, drinks, fun, but avoided making any but the shortest welcome and thank you speeches. Rumor has it that he owns at least one Pizzeria. We then had a very loud party. I tried asking a few political questions of the Head of Ideology, but I didn’t really get anywhere beyond the most scripted answers. How do your deal with change? Ideologist: we are continually adjusting and moving forward. I strongly suspect there had been some degree of pre-briefing for the Cuban attendees – in three separate conversations the topic of the five Cubans held in the USA came up. At the end, after tactful farewell speeches and everything seemed done, the CDR president suddenly turned to a giant poster of Fidel and proclaimed “And we owe it all to him!” Which caused Alex to roll his eyes some more. And then we fled. 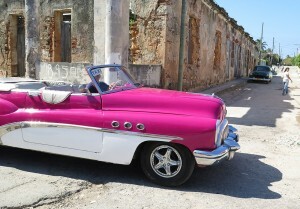 For many years, Cubans were banned from buying and selling cars. If you had a car, you could keep it, but you couldn’t sell it or replace it. As a result, old cars were cherished, and pampered 1950s American cars are common on the streets of Havana and other cities. As well as the classic American cars, there are also many Soviet Ladas from the 1980s and many new Chinese cars on the roads. Many people are assigned new cars due to their work and there are also lots of shiny new buses and taxis. However, only within the last years have private individuals again been allowed to buy new cars and these are priced at several times the US market prices. 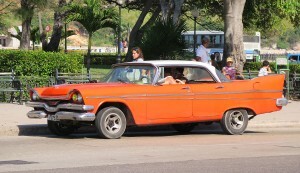 So I think we’ll see the classic cars for many years to come. 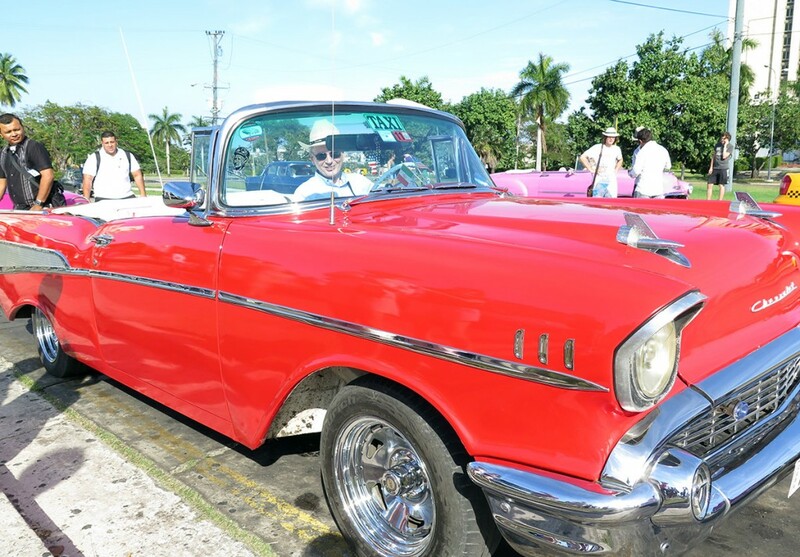 They’ve also turned into a significant tourist attraction in their own right – a tourist taxi ride in a well maintained classic can cost several times that for a shiny new taxi. The mechanical properties don’t always match the external appearance. 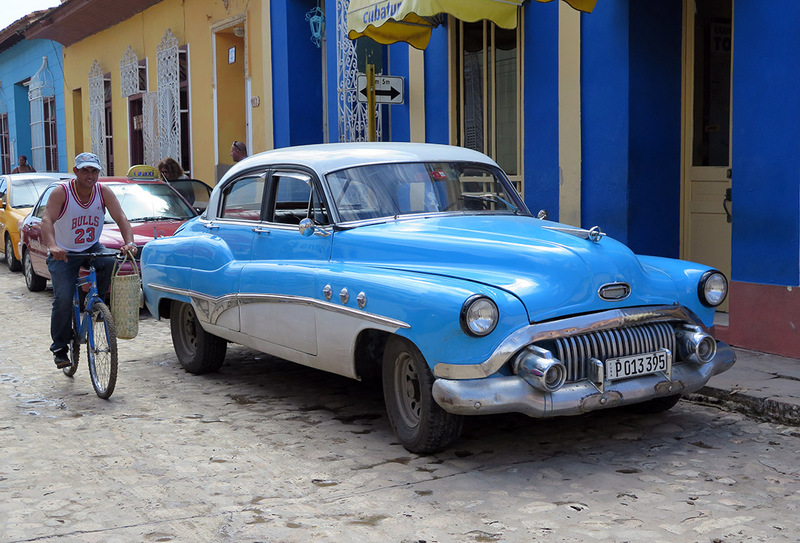 I took a couple of classic car taxis, and while one was fine, the other gasped and slowed to a crawl on even a very modest hill. But it was still fun to ride!